A tornado that was later estimated to have spawned winds between 158 mph and 207 mph lumbered across a 10-mile stretch of then-rural Dade County, killing five, hospitalizing 35 and destroying an estimated 250 homes along its quarter-mile wide path. The human toll was small compared to what would have happened to the same area today. Much of the destruction occurred at White Belt Dairy, a half-mile east of Hialeah, where buildings, trucks, cars and livestock were obliterated. The funnel turned toward residential communities north and northwest of Miami, killing three and injuring many others. Because the cyclone formed at around 1 p.m., thousands could see it in the distance and were able to escape by driving away or abandoning their vehicles. Witnesses described seeing cars picked up and carried a considerable distance through the air. 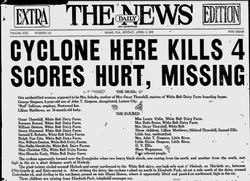 The Miami Daily News published an "Extra Edition" later that afternoon with vivid descriptions, including one of a man at the dairy picked up, "whirled high in the air" and "dashed to the ground" where his body was found two miles away "torn to pieces." 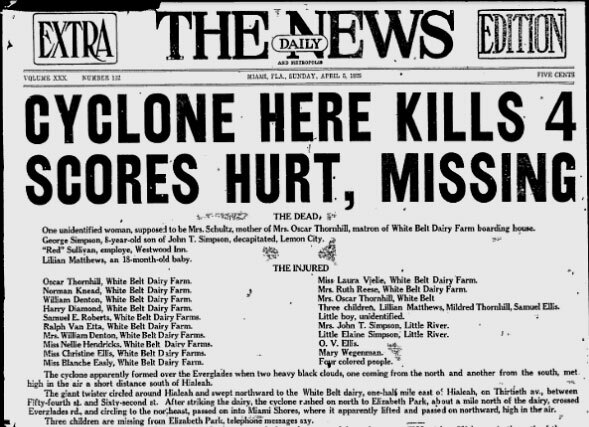 Two cows were killed at the dairy, the story said, adding, "Trees were uprooted, and a shower of dead chickens fell in Elizabeth Park and along other places in the path of the twister." A.J. Kipple of Elizabeth Park was driving toward his home with his two sons in his car when they saw the approaching twister. The three jumped out of the car and took cover in a clump of palmettos by the road as they watched the twister pick their car up and smash it to the ground, demolishing it. The tornado eventually moved out to northern Biscayne Bay before dissipating. 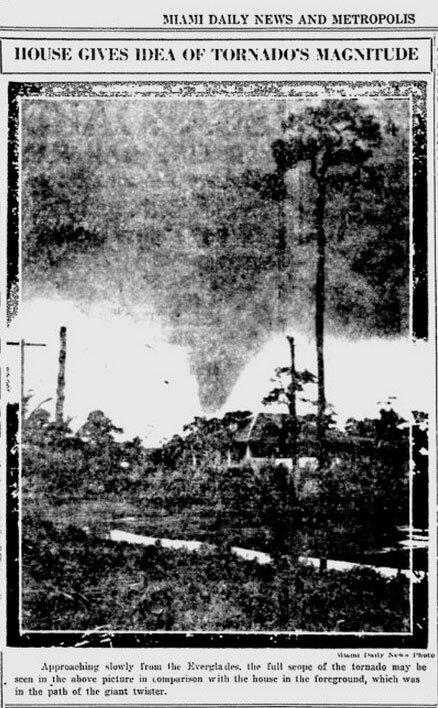 Read the story in the Miami Daily News: Cyclone Here Kills 4, Scores Hurt, Missing • Read an account in the April 1925 edition of the Monthly Weather Review • Read a review of tornados in South Florida: South Florida tornadoes: Could a Joplin-type twister hit here?